A low-mileage 1972 Ferrari 365 GTB/4 Daytona looks set to be one of the stars of a new all-Ferrari auction. The car will go under the hammer at Silverstone Auctions’ inaugural Ferrari sale, which will be held in association with the Ferrari Owners’ Club at the Northamptonshire circiut in May. One of 158 UK-supplied cars, the Daytona is finished in Argento Auteuiland will be celebrating 50 years since its launch at the 1968 Paris Motor Show, where it was announced as the most expensive and fastest road-going Ferrari ever built. Supplied by Maranello to H.W. Motors of Walton-Upon-Thames, chassis #15835 was delivered new to classic car enthusiast and historic racer Jeremy Agace and features air conditioning as an optional extra. The car still wears its original numberplate, MPB 125K. 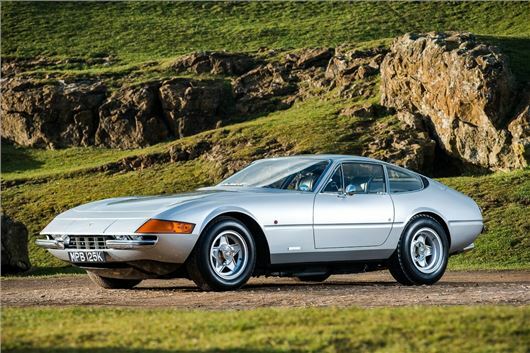 For more information about the Ferrari Daytona for sale and Silverstone Auctions’ ‘A Sale of Ferraris in association with the Ferrari Owners’ Club GB’, visit silverstoneauctions.com. Ferrari 246 Dino UK RHD! Only 30k Chairs and Flares!